Ariel will do everything to become part of the world above. She’s a very adventurous young lady, headstrong and brave as well. She is brimming with curiosity and she can’t help but follow her instincts most of the time. But, Ariel is still very young and naïve so it didn’t take much for her to fall victim to the evil sea witch, Ursula. Ariel is most famous for her purple shell bra, magnificently green mermaid tail, and long, wavy red hair. But she also has other clothes. She wears a pretty blue dress while going on a walk around the village with Prince Eric. Here’s everything you need to look like Ariel. 1 Purple Bikini Top Ariel wears a pretty purple seashell top. Use this bikini top as an alternative. 2 Green Scaly Mermaid-Cut Skirt You may not have a real mermaid’s tail but this green mermaid-cut skirt is a near imitation if you ask us. 3 Green Heels Keep to the theme by wearing a pair of green heels. 4 Red Wig Don’t forget to wear a flaming red wig. 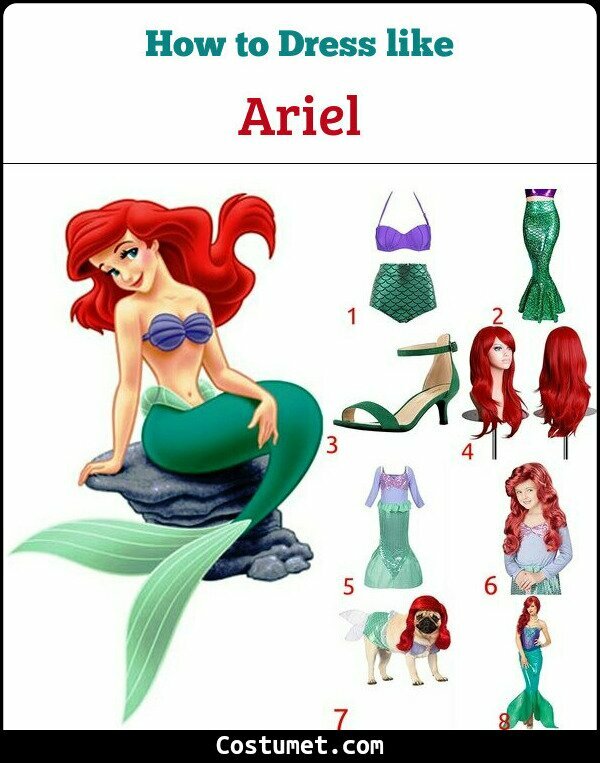 5 Kids Costume Set Transform your little girl into a beautiful mermaid with this Ariel costume set. 6 Wig - Kids Use this kid-sized wig to give your little girl a hair makeover. 7 Pet Costume Even your precious pets can become the little mermaid with this costume set. 8 Ariel – Mermaid Costume Set Turn into a beautiful mermaid with this costume set. 9 Blue Dress Set Go another route by wearing Ariel’s blue date dress. Ariel was voiced by actress Jodi Benson. She also voiced Barbie in Toy Story 4.